There has been an exponential interest and growth in home beer brewing over the lasts years, and more and more small-scale microbreweries are entering the commercial marked. As a microbrewer you can now get a helping hand from the university, where there is microbial expertise and analytical resources few labs can match. 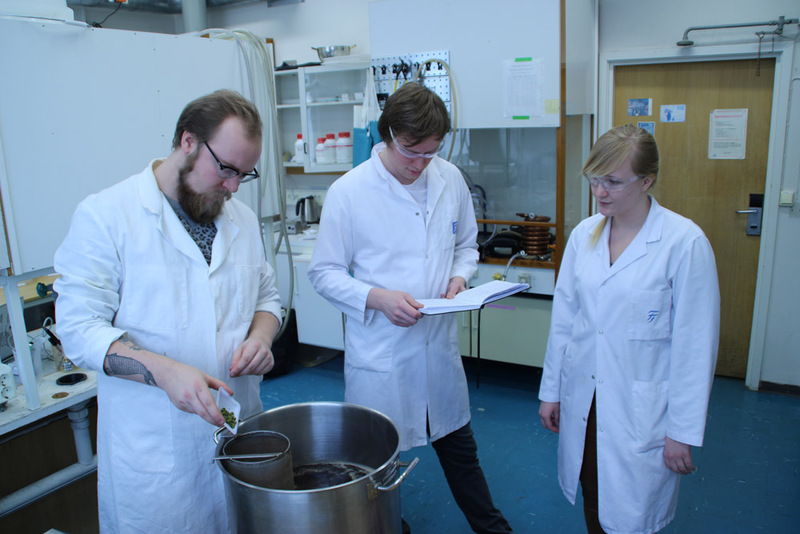 A little more than two years ago, several PhD students at the Department of Biotechnology at NTNU came up with a brilliant initiative – to start a beer brewing activity at the department. Beer is not only one of the oldest biotechnology products around, in our modern society it is also one of the largest when measured in production volume and sales revenues. Of course the department with it’s long history in industrial microbiology and biotechnology is the ideal place, both to produce beer of superior quality, but also to monitor, control and analyse at the molecular level all the different steps in the beer making process. To build expertise that can be valuable for the Norwegian beer industry, from the home brewer to the largest industrial actors. Creating a social meeting place for students and employees at the Department. To offer master’s and student projects. From starting out with one kettle and the most primitive start-up kit, our Brew lab now has two production lines each with capacity of 50 liters per batch. Many successful batches of beer have been produced as part of the technical training but also to gain experience in design of recipes. Furthermore, the first student projects have been completed. Eirin and Martin (see pictures) were studying sugar profiles as function of mashing and fly sparge temperatures, and how this affected sensory qualities of the finished product when fermented with different beer yeasts strains. Eirin continued her studies during the Master’s project and in January 2015 she submitted the first Master’s thesis in beer production in the Department’s history. 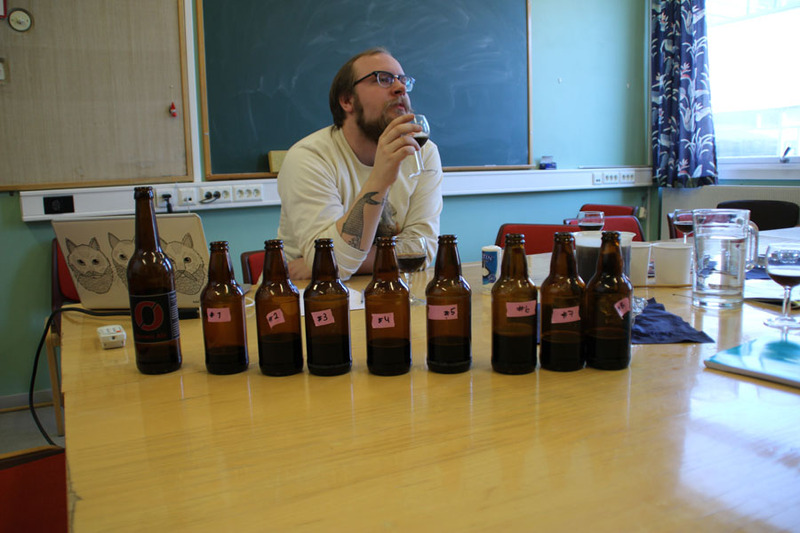 Our plan for the department brewery is to establish ourselves as a resource center, especially on the microbiology and analytical part, for Norwegian beer brewers, from the self-learned home brewer to commercial actors. We are currently developing protocols for simple yeast propagation for the home brewer, also to prepare yeast in optimal physiological conditions before pitching the wort. New and enhanced effects in spintronics emerge when using superconducting materials. The right combination of materials that merge superconductivity and spintronics creates, for instance, a flow of spins that has zero resistance. This could eventually lead to new types of functionality in low-temperature technology. Whereas electronics is the foundation for modern technology, the field of spintronics (or spin-dependent electronics) has in the recent decades proven to hold a real potential for generating technological advancements that may not only complement, but even replace conventional semiconductor-transistor based devices. The giant magnetoresistance effect is one of the most well-known direct implementation of spintronics in everyday appliances, in this particular case pertaining to harddrive technology and magnetic random access memory. The general objective of spintronics is to find ways to generate, manipulate, and detect spin flow. At first glance, spintronics might seem completely incompatible with superconducting order since superconductors in general expel magnetic fields and are comprised of spinless Cooper pairs as the fundamental building block. Remarkably, it turns out that superconductivity can adapt to the presence of magnetic order by creating an unusual type of spin-polarized superconductivity. This type of pairing is robust not only toward impurity scattering, but also toward the paramagnetic limitation of a magnetic field. 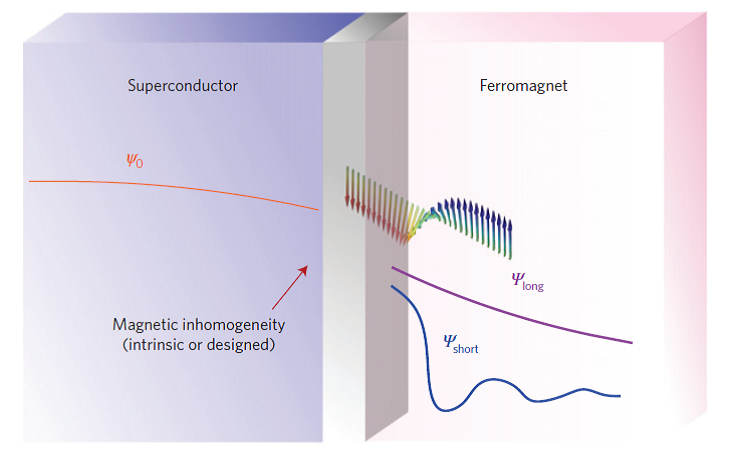 As shown by the illustration above: When a superconductor is placed in proximity to a magnetic material, superconducting correlations will leak into the ferromagnet due to quantum mechanical tunneling. These correlations typically decay very quickly inside the ferromagnet. 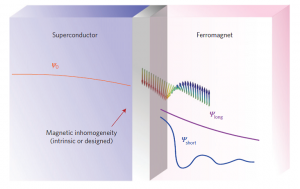 However, when there exists a magnetic inhomogeneity such as a domain wall near the interface, a new type of spin-polarized superconductivity emerges which can survive in the ferromagnet over very large distances. Now, traditional studies that combine spintronics and superconductivity have mainly investigated injection of spin-polarized quasiparticles into superconductors. However, a synergy between superconducting and magnetic material turns out to be possible through the creation of spin-polarized superconductivity, as described above. This type of superconductivity can arise at carefully engineered superconductor interfaces with ferromagnetic materials. There is presently intense activity focused on identifying materials combinations that merge superconductivity and spintronics to enhance device performance or even create new types of functionality. The results look very promising. It has been shown, for example, that superconducting order can strongly improve central effects in spintronics such as magnetoresistance and spin injection. The intersection between superconductivity and magnetism represents an exciting research arena. On the one hand, it hosts very rich fundamental quantum physics – on the other hand, it also holds the potential for creating novel types of quantum-based technology in low temperature nanoelectronics. The illustration a) shows a schematic overview of different ways to use superconducting spintronics, both in equilibrium and non-equilibrium. Different types of common experimental setups are depicted in b)-d). Superconducting spintronics. J. Linder & J. W. A. Robinson, Nature Physics 11, 307–315 (2015) doi:10.1038/nphys3242.